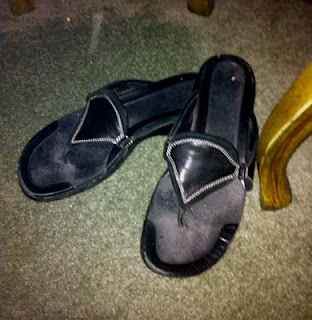 Okay, you aren't the only one who leaves shoes where ever, including the entryway. I don't think anyone puts them away, really. Except me on PMS, then I'm a terror after whoever left shoes in my freaking way out the door that could have resulted in a broken nose because they tripped me and I slammed my face into the door. Yeah that. I'd like to say I do it too, but I am kinda a neat freak and I HATE shoes all over the place. I would say I am like Furry Bottoms when she is in PMS - except I'm like that ALL the time! 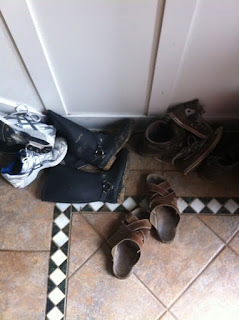 In fact, I have an old chest at the front door for the boys to throw their shoes in. Only trouble is, they take them off AT the chest, but not IN the chest. (So I have them partially trained). The only thing I can agree upon is that I have the same amount of shoes as you. LOL! I don't wear shoes in the house. 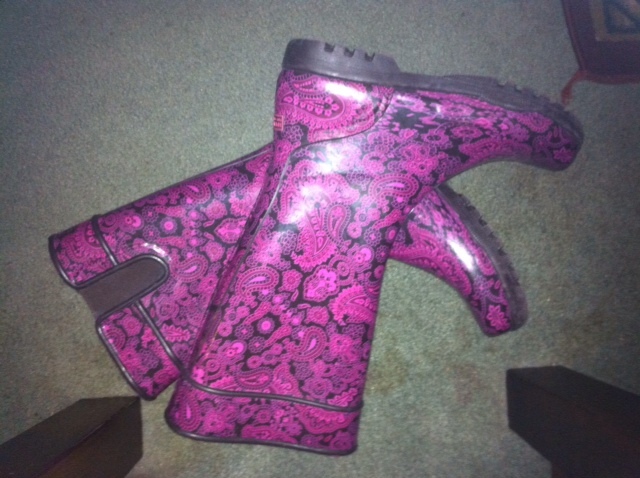 I have a pair of clogs that I throw on if I have to be in the garage. That floor is gross. But I'm usually looking for mine too. And I don't think I have as many pairs as you. Maybe it's a country girl thing. Living in the Pacific Northwest most people take off their shoes because it's wet outside. And who wants to trudge dirt and mud all around the house? I think architects need to redesign houses so that there's a closet of some sort at the entry way for shoes and jackets so that you can take them off right away. Why didn't anybody think of that before? you're not alone, there are many "japanese" who live here. come in the house, take off the shoes. Sorry honey. Our shoes come off at the door. 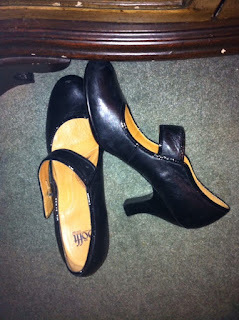 However our shoes NEVER make it into the closet. They are all in the front entry way. 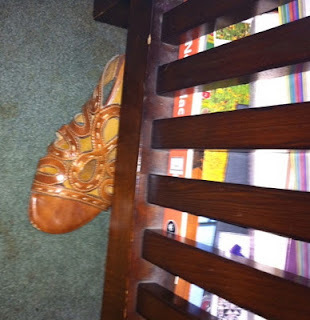 I get mad at people who come in my house and keep their shoes on. My dad is the worst culprit.. I guess he thinks I have magic fairies that sweep all the damn dirt and hair off my living room floor. being the hater of shoes also, I do leave a couple of pair in the kitchen, but I do try to get the rest of them into the closet. My husband, would put them there himself if I left them hanging around like, ummm, you do. Tami, i wish I could be more neat, but, well, I have only myself to blame. You hit the nail on the head with that one. It's always wet, muddy and icky out there this time of year! Nolie, it doesn't bother me if people wear their shoes in my house I have the dogs and numerous bipeds, but mine always come off! Dazee...heehee. I thought I put them where they would be easy to grab, but I guess I'm just messy. 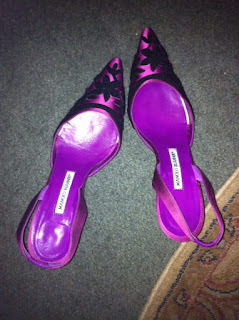 Queen, no one usually wears shoes in the house here except for Nikki. She does, with lots of socks, because her temperature control gauge doesn't work because of a birth defect, but I have a feeling she just like to show them off. I'm really surprise at how many of your commenters have said they remove their shoes in the house....I thought that was more of a Canadian thing. 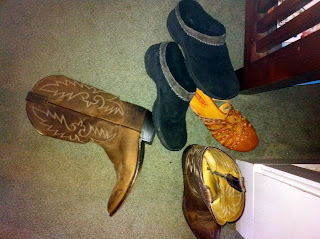 I have OCD, so I always take my shoes off at the door, and only leave EXACTLY 2 pairs at the door at any given time! And I do the same for everyone else in the house! One of the good/bad things about having OCD! 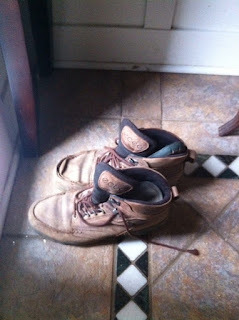 You are definitely not alone I walk in the house and take my shoes off... leaving them in the kitchen, in the doorway. They then end up in a pile inside my bedroom door. Yep, rummaging thru shoes and not finding the ones I want. It doesn't matter I have 23 more pairs in my closet. (Too bad I can't find them). I have a shoe fetish... I admit it!! The purple shoes rockkkkk. I want them! I seem to be OCD about BUYING shoes, just not putting them away. Oy! Tere! Yea! A soul, or sole mate! Oh Inner Chick I wish, that would ROCK! You are not alone...lol. The only reason our shoes are put away, is because we have a puppy who eats everything. I mean, he eats walls for crying out loud, shoes would be nothing for him! The shoe thing? Perfectly normal. In fact, after 20 years, my husband now does the same thing. But......he isn't good at it. I'm always tripping over them in the dark. Damn! it's funny you guys, or as I used to say y'all, usually get more rain than we do. Although in Texas it comes all in one hour it seems! People here freak if we get a 1/2" a day. middle child, I trip over my own shoes. you'd think I'd learn. I was looking for a pair of shoes the other day and he said "get a shovel and go through your closet." Ouch! I love this. I actually bought a freaking bookshelf for my closet to store my *ahem* collection of shoes(shoe racks I've seen aren't sturdy enough for me). I was very disciplined about keeping them organized and stored in their place in the closet...for a week or so. Mine are everywhere too, but somehow wind up in a pile in the kitchen. I have no idea why! mine are everywhere. I never really noticed it until today. I have a shoe organizer and it's full, and my closet floor is piled. I need a huge closet, who am I kidding? I'd still leave my stuff out. Ours are piled in our entryway as well. Even though I have one of those over the door shoe things on the inside of the front closet no one [except me!!] can manage to put the shoes away. I found the missing shoe from the first picture is in the second picture! Talk to my wife, our closet floor is three feet deep in her stuff. A lot of girls keep very messy rooms. Most kids think girls are neater than boys, but this changes as we get older! Haha, I always lose my shoes because I take them off wherever and just leave them. Then when I want them, I can usually only find one. The other one is usually lost under a chair or even in another room! !